Lots of action for a shark movie, it was enjoyable. I liked it, lots of action. Unbelievable. Poor Jaws spin off!!!! Fun movie , kind of JURASIC PARK under water . No bad language , nothing scary for younger kids. Good guy's win. Don’t look for anything deep here and you will enjoy this movie...it’s summer fun, exactly what you would expect from the title, not rocket science?? OMG WOW. This movie was action for sure but an excellent thriller all the way. I was alone and I could not help letting out a small scream, Oh, No! Just when you thought it was over and they got the Shark then there comes another huge Shark and more tragedy. The little Chinese girl is cute. And the respect and love grew between the hero and the girl's mother is heart warming. The movie had everything in it. It is true the movie lost its creditability when the Shark went in the beach area where there were swimmers. Perhaps, the Shark was mad by now and sought revenge for anyone evading his territory. Good Movie, enjoyed it, went by fast. Yes its another Jaws but it is enjoyable. Almost better than JAWS 3-D. This should do for sharks what Snakes on a Plane did for Delta Air. Another Hollywood rip off. The movie wasn’t released, it escaped! Formulaic, predictable, and not so good. A piece of junk, but well made junk. Wow this movie was super cool. Oh yeah!!!! Excellent movie. We know is fake lol but it was an amazing action movie. Jaws on steroids. Lost credibility when Meg is cruising thru waters where swimmers are wading. A + is when you see Longmire star Robert Taylor in a supporting role/hero. Great movie. It had my wife jumping in her seat. It has a lot of good action parts thru out the movie. 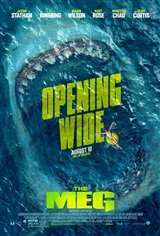 I really enjoyed this move,great action movie, a few times I was at the edge of my seat.Good story for a shark movie. I Really enjoyed this movie. Great comedy moments a few feels moments and a lot of well timed jump scares and startles. Had to subconciously dodge a flying plastic cork/door at one point as I watched it 3D. Everything you want in a shark movie. Absolute thriller! Every character very good! Casting is awesome. Literally jumped out of my seat four times!!! Can’t wait for the sequel. I am definitely going to see it again. Adore Jason Statham and the billionaire oh yeah and the little girl and her mom and grandpa and the guys..... well crap I loved the whole dad blame movie!!! Go see it you will love it! I thought movie was great, few surprises in it and I love Jason Statham. Lots of action. Would even go see it again. Not unpleasant but utterly preposterous. One he-man escapes far, far to many brushes with death to go one-on-one with a mammoth ( but dumb) eating machine. Guess who wins? A good summer flick. Really enjoyed! Just enjoyed it! And the "Pippin" seen was classic! Ok, not that exciting. Good summer movie with a shark. It was ok, not blood and body parts.....different than I expected. It was more about the scientific aspect. Honeslty, not that exciting, but I liked the cast of actors, and then, 2/3's through, you thought it was over, and of course, more of the shark. This movie gives you everything you want in a 'shark' movie! I really liked it and thought it was very well done. Good summertime flick. Lots of cliche's and predictable plot points, and in some parts some pretty cheesy dialogue, but for pure entertainment value it is never boring and has some pretty decent action sequences. One of those "leave your brain at the door and just enjoy with a big bucket of popcorn" movies. If you're looking for an artsy/indie movie with intellectual overtones and character-study feel, this is not the movie for you. Also, this movie is surprisingly not that bloody. Whether that's a good thing or a bad thing is for you to decide. Good action although highly predictable. You will like if enjoy shark movies. pretty good acting but, the movie didn't show enough of the star in my opinion ..... by star I mean the shark . Some funny bits ,some scare you bits , but mostly the shark scenes are a fin gliding through the water . That earns 3 stars in my book . It was very well done. It will keep you engaged and on the edge of your seat the whole movie. You will definitely love this movie!! Wow! Definitely one of the best movies I have seen in a while. It had me on the edge of my seat and screaming with the best.